Capsule Wardrobe + Packing Trick: 5-4-3-2-1 - Real life, on purpose. I know, I know. There’s a billion and three articles on building capsule wardrobes or packing everything you own into a carry-on. I’m a sucker for those things. The Curated Closet is one of my favorite books these days. But guys. This is honestly the best capsule wardrobe and/or packing trick EVER, and I feel like a dang genius for figuring it out. My favorite combination is 5 tops, 4 bottoms, 3 pairs of shoes, 2 layering options (like jackets or sweaters), and 1 dress, but the recipe can be shuffled and adapted in so many ways. Prefer dresses to pants? 5 dresses, 4 layering options, 3 tops, 2 pairs of shoes, 1 bottom. Don’t wear dresses or skirts at all? 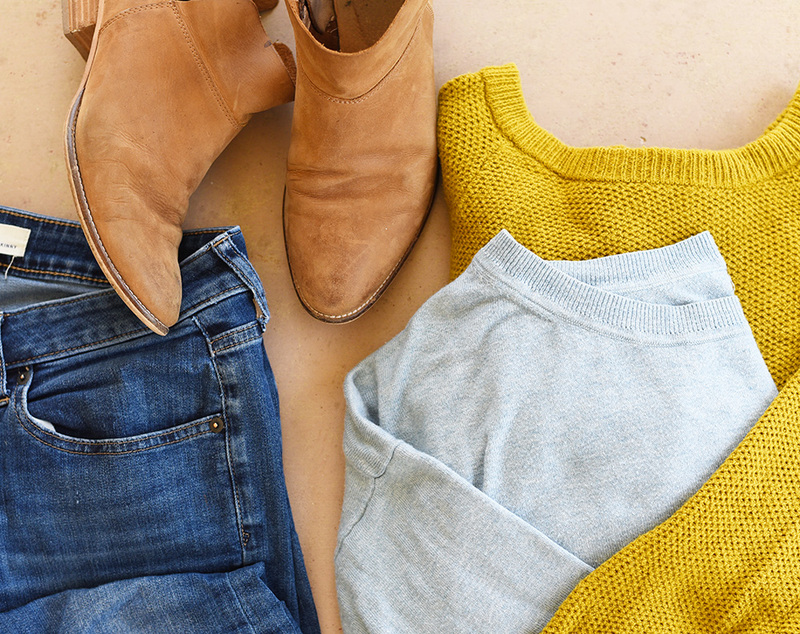 5 tops, 4 pairs of pants, 3 pairs of shoes, 2 layering options, 1 blazer. Going somewhere hot? 5 tops, 4 bottoms, 3 dresses, 2 pairs of shoes, 1 swimsuit. Going somewhere cold? 5 tops, 4 bottoms, 3 pairs of shoes, 2 sweaters, 1 coat. Adjust as desired. Add in accessories at your discretion. Obviously the more tops/bottoms you have, the more different outfit combinations you can make. 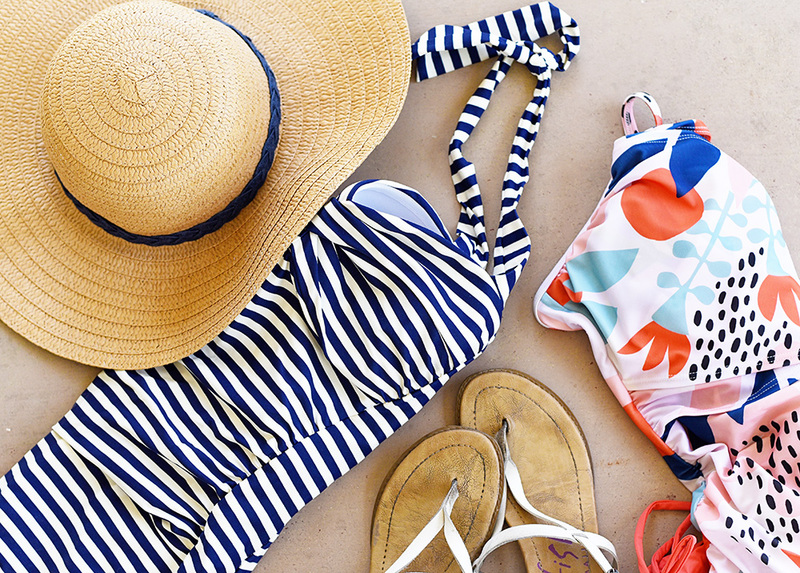 If you’re packing for a week or less, you only need so many ways to mix + match. If you’re packing for over a week, you may have to do laundry anyway. (Underwear is not included, since I assume you can figure out your under-needs on your own.) 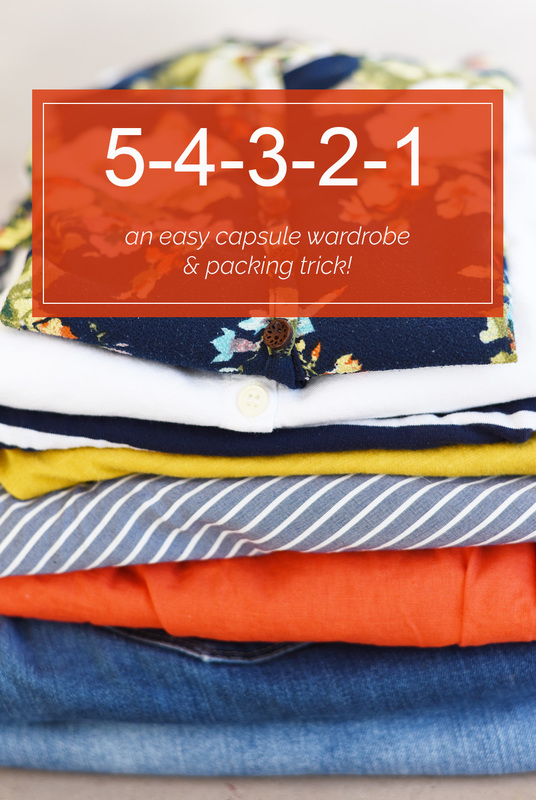 For capsule wardrobe purposes, you could create two or three 5-4-3-2-1 “capsules” that can be intermixed or kept separate. Do one for work and one for leisure. One for dressier occasions and a casual one for everyday. And while we all know neutrals are easier to mix + match, you can totally use this trick with ALL THE COLORS if you wants. That’s why I deliberately chose a red, yellow, and blue palette for these photos. A wardrobe full of color is still remixable! That’s probably not a word but I don’t care! Because it’s true! The more I use this as a lens to look at my clothing, the easier it is to see how well each piece in my wardrobe works with everything else. I have a red tee that looks best with a-line skirts or one particular pair of pants, and that’s useful information to have. If nothing else, I know if I really want to bring that top on a trip, I’ll also need to pack coordinating bottoms…which in turn means I want to choose other tops that work with those bottoms. Make sense? It’s also helped me identify some holes in my closet. I came up with a mostly great 5-4-3-2-1 list but couldn’t choose a third pair of shoes. As I created hypothetical outfits with my choices, I realized a pair of casual black flats would be perfect with several of them. So now I’m on the hunt for some casual black flats. Maybe sneakers? Maybe not. But I’ve got some criteria that will help me avoid any impulse buys. What I love most is that you don’t have to be a style expert or a travel guru to use this system. It’s adaptable to your clothing style + needs, even if all you wear is t-shirts + jeans. Are you good at packing light? Have you tried a capsule wardrobe? What do you think: would this system work for you? I’d love to hear if anyone else tries it! You are brilliant! I love this system–so much easier for my brain to grasp than many out there. Also, I like the “leather” ballet flats from Target (I have them in camel) and they’ve held up better than an almost identical but twice the price pair I got at Kohls. 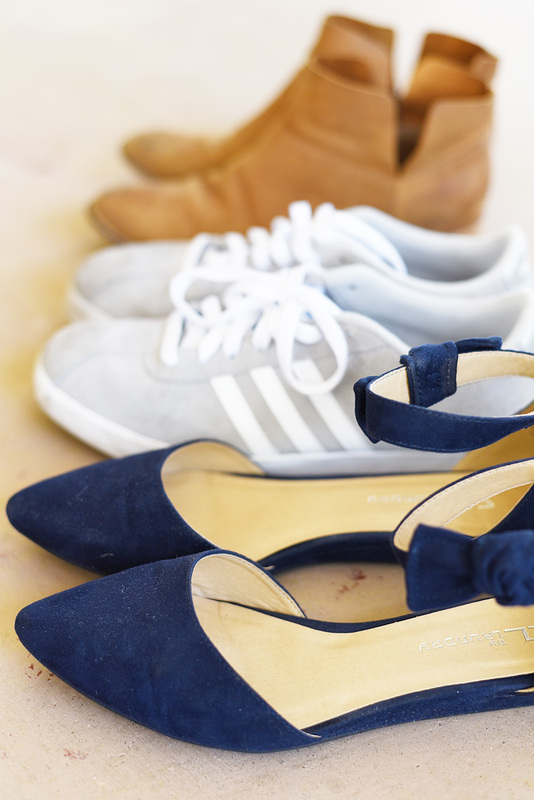 If ballet flats are your thing! Oh I hope it is helpful for you! And while I love ballet flats, I’ve had to give them up because my feet get too stinky too fast in them. It’s embarrassing. Slip a pair of slim odor eaters in them. Problem solved! Try Gekks! I am back in love with my ballet flats. So great and simple tips but also very helpful! I do not know how this came to your mind but it is really brilliant. You can save so much time and space, and all you have to do is to read this blog! I have a lot of wardrobes and this really helps. how did you come up with this? Love it! Where is the yellow sweater from? Madewell. It’s one of my favorite things in my fall wardrobe! You’re a genius! I love this system.